British soldiers in Balsamea woods! While browsing Rebecca in the Woods, the blog of a naturalist and environmental educator, I bumped into her photo of a lichen she found on a tree stump in Ohio. We have an item that looks like the same thing, carpeting a couple of big old tree stumps in the place we call Five Stump Skypatch (a forest opening about 100’x30′ where loggers took out five big trees a long time ago). As with many other flora and fauna rattling my ignorance, I do not recall ever seeing it anywhere but Balsamea. Not surprisingly, authorities say it is common throughout northeastern United States and Canada, with 128 cousins here and in other regions around the world. 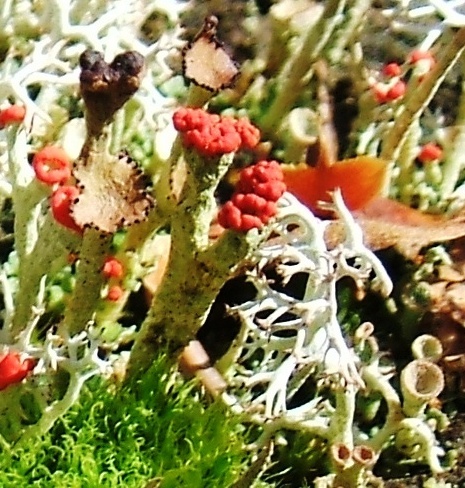 Cladonia cristatella, a.k.a. British Soldier Lichen, one of a variety of Cup Lichens. 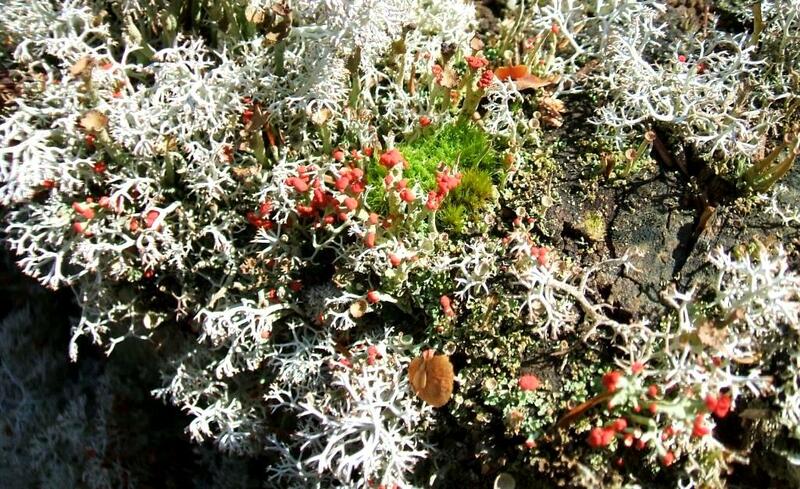 This other-worldly looking red-capped Balsamean is Cladonia cristatella, with the common name British Soldier lichen. A lichen (LIE-ken) is a mutualistic, symbiotic merge of a fungus (plural fungi) and either an alga (plural algae) or a cyanobacterium (plural cyanobacteria) — the kind of bacterium that does photosynthesis. In this case (plural cases), it is an alga. Lichens are sensitive to air pollution, so their strong presence indicates clean air in the environment. We knew about the clean air here at Balsamea, but it is nice to see it officially declared by nature itself, as we have several kinds of lichen (lichens). Reindeer, caribou and possibly (according to one source) Whitetail Deer eat Cladonia cristatella when other food is scarce. At Balsamea, we have surplus Whitetails. If they eat Cladonia cristatella, maybe it is only as a last resort, or else our small Cladonia patch could well be gone. Maybe they only use it for medicinal purposes? We have no wild reindeer or caribou in the Adirondacks. But some tame reindeer are professionally employed nearby at Santa’s Workshop at North Pole (Wilmington, NY), twenty miles from Balsamea. In multiple places, I read that a lichen (Lecanora esculenta) is likely the manna collected (as food fallen from heaven) by the Jews during their wilderness journey from Egypt to Palestine. This kind of lichen is known to dry out and blow from the mountains to the desert in great quantities, enough to collect in layers or piles. The Collaborative International Dictionary of English defines manna lichen at length in scientific terms and as food. Varieties of manna lichens are still traditional food sources in the region. To the Jews, at that time in their experience and in the known science of the time, it was food from heaven. Now we know it didn’t come from heaven, but from lichen. That’s good. Dr. [Anne] Pringle’s preliminary results show that as a lichen grows older and larger, it is less likely to die. The definition of aging changes from organism to organism. Death, as we know it now, is animal-centered. The rules for fungi, as well as the subjects of similar studies like the bristlecone pine and the wandering albatross, are something different. To learn more about lichen and Dr. Pringle’s research, check out this article by Hillary Rosner in the New York Times. Dr. Pringle studies aging in fungi and lichens at a place known for aging, of a sort: a cemetery. So, it pays to take a while and really look at what is going on in the woods. These British soldiers are special in many ways. They are not just colorful pretty faces on fantastic bodies. They are air quality indicators. They have complex personalities (mutualistic, symbiotic integration of fungi and algae). They are food for reindeer, caribou and Whitetail deer, which of course is no surprise, since they have distant cousins who are food for people lost in a desert. They grow less likely to die as they age, and they really take their time about it (a couple of millimeters per year). And they have relatives in the bird poop recycling business. These could be important Balsameans to know. Really tiny ones, but ones with a lot to say for themselves. Special thanks to Rebecca in the Woods, who addresses the lichen topic several times in pictures and text (plural texts). Stephen Sharnoff’s Lichens of North America – terrific photos of more lichens than you can shake a fungus at. Tom Volk’s Fungus of the Month for July 2002, from Tom Volk’s Fungi work in the Biology Department at the University of Wisconsin-La Crosse. British Soldiers from Mark Moran’s Study of Northern Virginia Ecology designed for elementary school, but comprehensive as well as easy to swallow. The Lichens page at The Backyard Nature Website (a terrific resource) has a comprehensive, digestible report on lichen life.